Landing page is the most important aspect of your website and one of the major concerns of any online marketer is to create an awesome one. While there is no dearth of landing page creators available in the market, you’ll have to do a lot of research to find out the best among the lot. Here we have reviewed Unbounce Vs Leadpages Vs GetResponse, three leading landing page software to make your job a bit easier. Here we have reviewed all three of them based on Features (i.e. Templates, editor, and integrations) and Price. This grid by grid comparative review would hopefully clear out your doubts and save you a lot of time while choosing the best landing page service for your business. Pre-designed templates are very important when it comes to landing page creators. Not all businesses are large enough to hire full-fledged IT team or web developers to create their landing page. Thus most good landing page creators provide some pre-designed templates that one can tweak to create a cutting-edge landing page. All the templates offered by this software are mobile responsive and sleek in design. In case you are not satisfied and want little more advanced landing pages for your website, you can buy some pretty awesome templates from the software. Although you’ll have to shell out some extra bucks for that the templates up for sale are really amazing. If you are developer, you can build your unique landing page with HTML coding too. All the landing page template templates offered by Leadpages are mobile friendly and SEO friendly. Not only template, the software also offers more than 1000 high definition images from their gallery that you can use for free. You can also edit the HTML code of the existing templates or build a unique page with HTML code. The templates featured in GetResponse are all responsive in design, which means the pages will adjust themselves according to the viewing platforms be it mobile, tablet or desktop screen. Once you select the best template for your page, the next big step is to edit and customise the template to suit your website. Here, it is imperative that you look for a software that features an easy to use editing interface. The editing interface of this software is pretty easy to handle. The interface is clean and the drag and drop editing technique lets you customise almost every aspect of your page. And the best thing is you’ll not have to touch the HTML codes for that. 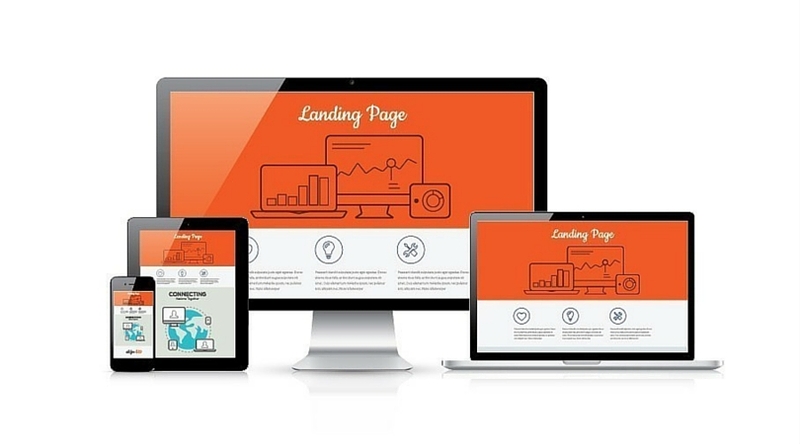 This way you can create a landing page with ease, even if you are new to the business. Leadpages also features a drag and drop editing tool. You can add, remove or customise any designing aspect of your landing page without editing the HTML code. This facility makes the software perfect for any novice marketer. On the other hand you can build your landing page from the scratch with HTML coding too. So, you’ll get the creative freedom of an expert marketer too. You can save your finished pages for future, set up an A/B split test or can publish them directly from the editing page. GetResponse features one of the most neat and clean editing interfaces we’ve ever encountered. The drag and drop editing tools are simply cake walk to use. Even if it is your first landing page, you’ll be able to publish one dazzling page on you website in just minutes. Now, if you want to build a unique page with HTML coding you can do that too from the editing page. Once you are finished with your landing page, you can save it for future, set it up for an A/B split testing or can publish it directly from here. We choose to customise the above template and it was ready to publish in just 2 minutes. While you are publishing your landing page, you might as well incorporate some other services and software to promote it or to make it more useful. Now, it is very important that your landing page creator allows the integrations with the particular third party software or services. The greater the number of allowed integrations the better it is for you. Well, cost is always a major deciding factor in any purchasing decision. While you of course want the best of services, you sure don’t want a hole in your pocket. You can see the Unbounce annual plans above. The starter plan stars from $49 a month, which is a bit on the higher side especially for small businesses. You can see the LeadPages annual plans above. The basic plan starts from $25 which is quite low. But if you look closely you’ll find the basic plan does not provide you some of the major features without which you’ll practically be handicap. So, although the starting price is low, it’ll be very unwise to go for it. You can see the GetResponse annual plan above. The basic plan starts from $15 a month, which is superbly affordable even for a small business. Moreover, all these plans include the complete GetResponse email marketing service as well, saving a lot of money on your total marketing mix. So, sign up for the 30 days free trail today and check out the awesome services on your own.